When I was a wee, tiny girl back in the olde country, I used to make my own bird books out of straw and charcoal. Mmmmokay no, but I did draw my own bird books, and with very creative taxonomic order placement, to be sure. 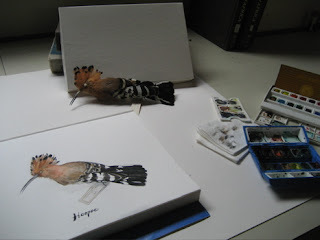 The Hoopoe (Upupa epops-say that one a few times quickly) was always included because it looked like a something Dr. Seuss would create with it's apricot-colored head and crest, and candy stripe black and white primaries. Hoopoes are in the same order as Kingfishers and Bee-eaters, and can be found throughout Europe, Asia and North Africa, as well as Sub-Saharan Africa and Madagascar. 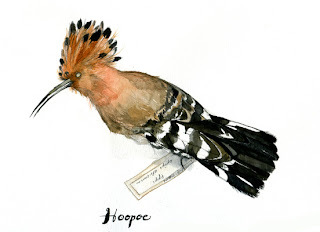 Fossil records show an existance of a Giant Hoopoe that lived on the island of St.Helena, was flightless, and went extinct shortly after its 1502 discovery. Noticing a pattern here, folks? Kakapo - large, flightless (New Zealand - a very large island of sorts), and almost extinct, Dodo (island of Mauritius) - large,flightless, and very extinct, Giant Hoopoe - you get it. Sooo, if you are considering moving to an island, you can expect to become large, flightless, and to wait around for the next boatload of hungry sixteenth century sailors to come by with their hungry rats and pigs to signify your impending doom.